Today is a very special day: Brother Pink's Birthday! To celebrate the occasion of his birth, I decided to whip him up a little something that I'd been rolling around in my head for a while. Something about the savage, dead-eating nature of the kroot has always made me think of them as the archetypical savages of the 40k universe. Though they team up with the Tau and use rudimentary firearms, I picture them being more comfortable with blades and arrows than loaned Tau tech. 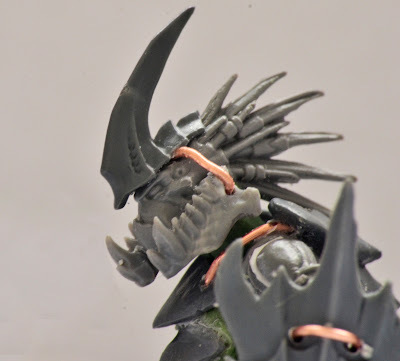 Somewhere along the line, these ideas fused with the thought that a Tyranid warrior head would make a damn good shield, and then all I could picture was Kroot running around, hiding behind Tyranid armour and throwing scything-talon-tipped spears at their prey. It was an idea I'd first come up with as something I could fashion for Moloch and his all-kroot Tau army, but when I was trying to come up with something to make for my brother for his birthday, I figured he might like some Kroot Nid hunters. He's a sculptor himself, and we often argue over which is better: clay or epoxy. He keeps trying to get me to fire things, and I keep trying to get him to give up on such a fragile, labour-intensive medium. He keeps on making me these fantastic things from clay, and yet I've never made him anything, sculpted or otherwise. I thought I'd make up for it this year. Thus was a Kroot Tyranid Hunter born. This guy is meant to be the squad leader, and I've got at least three more of these guys in me. I'm not sure if they're going to be four different shapers, or if I'll eventually do him a whole squad of them. In that picture you can also see the thin copper wiring I used to fashion the ties for all of his armour. I really wanted it to look like all of these Tyranid armour plates were just tied on in a rudimentary way. The story is that all of these guys' armour and weapons come from pillaging the corpses of dead tyranids. I wanted to illustrate this overtly in a kind of diorama on his base, wherein he has just taken out a carnifex with his looted bonesword, then proceeded to cut out the creature's tongue to use as a whip. I intend to sculpt a little more gore onto the base, such as riven flesh where he's cut out the tongue, some blood and gristle on his stealer-talon knife and shield hand from pulling out the tongue, and maybe some more flesh around where the bonesword has gone into the Fex head. Hey ! What units do the tyranid parts come from ? 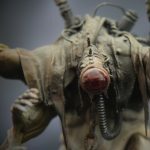 Don't play nids and would love to try and recreate this on one of my kroots, so need to get the right bits :) Thanks and amazing work, will poste my attempt once it's done ! That's a tough one since I have a limitless supply of nid bits, so I don't tend to give much thought to where they came from as they're all mixed together. I can tell you that some of my fave nid bits for conversions like this come from the Gargoyle kit. That's where his helm came from. I believe the jaws were trimmed off a carnifex, and the armour plates down the front are just standard tyranid biomorph sprue pieces. The arm shield is a warrior head, and the whip is from a Carnifex head. His shin guards are armour pieces off of deathspitter guns. His knife is a genestealer scything talon, and his arm guards are the lower parts of warrior legs. So it's going to be tough to pull them together easily unless you have a friend who plays tyranids! Where can I go to see the finished, painted version of this? I would love to see how it turned out! You asked just in time, Justin. My brother just finished painting it, and it dropped it off with me for photographing on his last visit. So, I should be getting you some painted pictures...soonish.